Many years ago here was a song popular with this line in the chorus (I translate it for you into English, while the song is in German): “Everything has an end, but only the sausage has two of them”. This post is the end of my series on Cuba. I hope, you liked it. But, don’t be afraid, next week I start the next series. Here’s my résumé on Cuba: It’s a nice country, friendly and open-minded people. A country with some problems, but the people try to manage them by creating new ideas. Cuba is undergoing huge changes currently and I guess, during the next few years it will change more than during the last 50 years. Instead of saying “Goodbye” I’d say more likely the German “Auf Wiedersehen” (see you again) or the French “Au revoir!”. 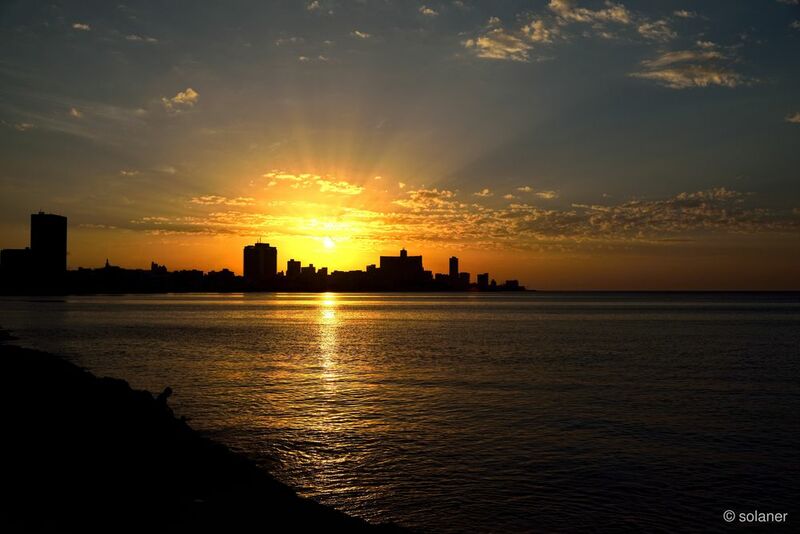 In case, you have Cuba on your bucket list, I’d recommend to go as soon as possible and don’t wait too long. There is so much changing, you’d probably miss that original spirit of Cuba. I guess, I already wrote more on this in an earlier post. Do you remember Sandy, the heavy hurricane in the Caribbean from December 2012? Well, Cayo Levisa also was hit quite hard. Many mangroves were removed from the shore, trees were cut and several other damages. The hotel, consisting of about 80 log cabins and a central house of stone with the reception and the dining room, didn’t show any damages. I guess, it will last many years, until the nature recovers from that storm. As I wrote in my last post, it was quite cool on Cayo Levisa because of the wind after the storm over the sea. As you can see in the photos nearly no-one is on the beach and the wind brings high waves. Also, the palm branches are bent by the heavy wind. Our stay here was planed for being a beach holiday with swimming, diving and snorkeling. Instead, I walked around wearing more clothes as during the last days and enjoyed the nature. I attached a few more photos than usual in this posts gallery at the end of this post. I hope, you enjoy them. 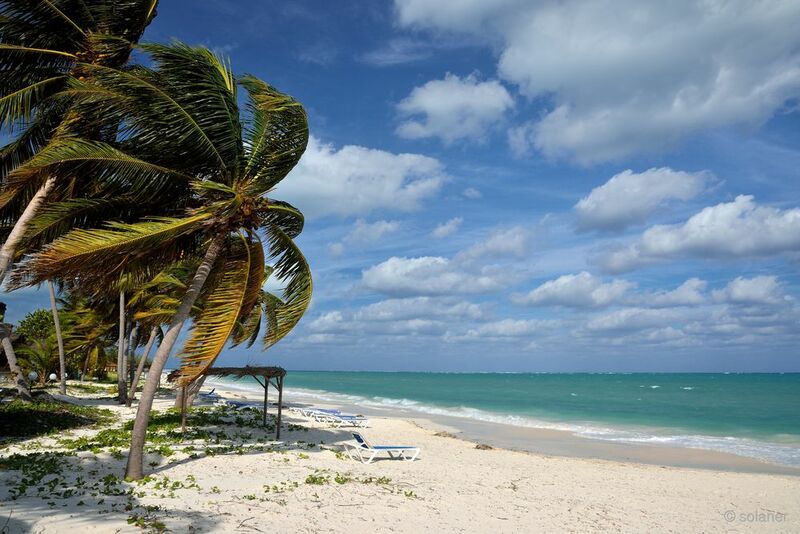 Cayo Levisa is a small island at the north shore of Cuba, right opposite to Florida. 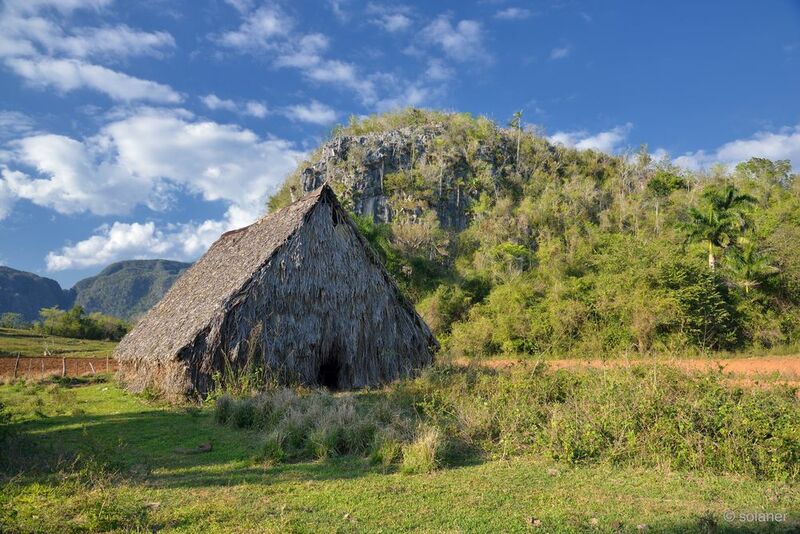 The bus needed more than two hours for the distance of about 50 kilometers from Viñales to the small ferry harbor, because of the very bad roads. The first 30 kilometers were quite fine, like most of the Cuban streets we saw. But, the remaining 20 kilometers were very bad. We arrived quite early at the ferry harbor. While waiting for the ferry, we got notice of a coming up very slowly. It seemed, the car’d have a technical problem. When the car finally arrived at the parking ground next to the bar where we were waiting, we noticed, the car was a rental car and 4 young ladies came off. They checked the engine and some more parts. Some Cuban people also looked for the car. As far as I understood, the front axle or a wheel was damaged because the driver didn’t pay enough attention to the street or was too careless. 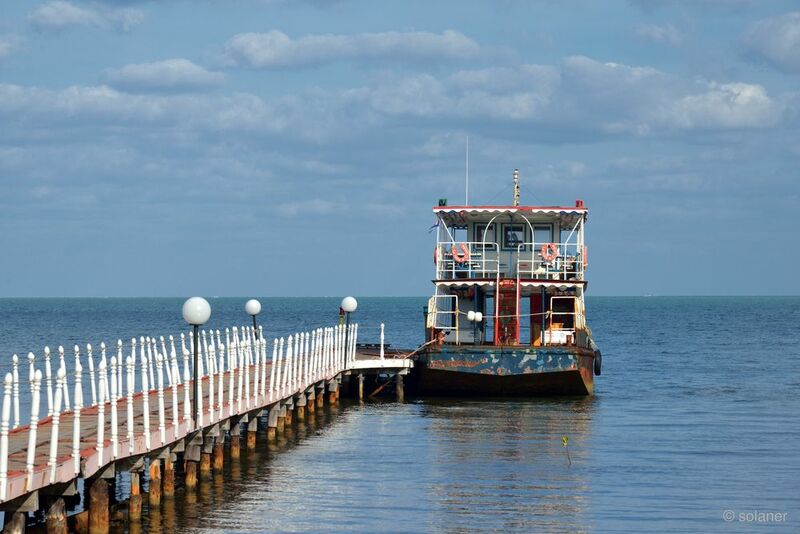 I don’t know about the end of the story, because the ferry arrived and we got on board for our passage to Cayo Levisa. 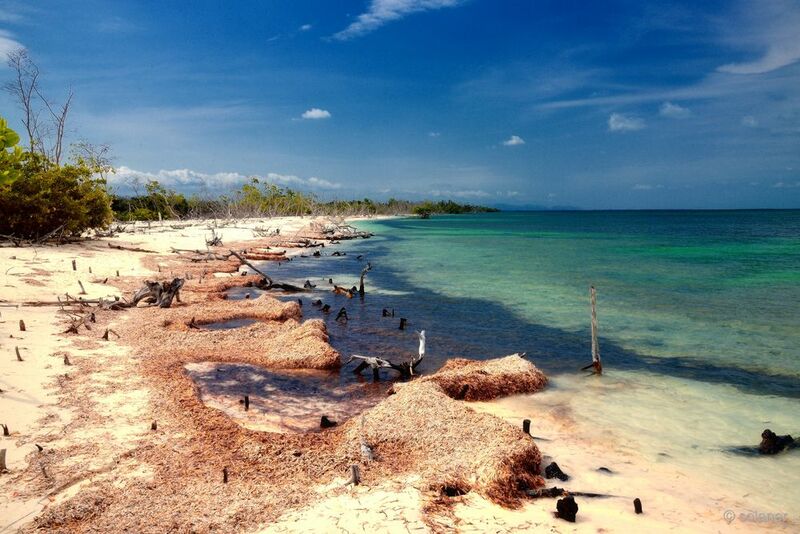 About an hour later we arrive on Cayo Levisa. Unfortunately the same afternoon we were able to see a heavy tropical storm on the sea and the sky became cloudy and gray – no more tropical feelings 😦 This kept on until the next afternoon, when the sun came back. But, with a strong and cold wind. Being at the beach was quite difficult. Strong tropical sun forced us to put some clothes away, but the wind forced us to up them on again. I’ll tell a bit more in my next post. is a cave near by Vinales. For an entrance fee of 5 CUC you can visit the first dry part of the cave and get a boat transit to a flooded part of the inner cave as well as getting transported to the exit by boat. The ground of the cave is covered by plan concrete and equipped by a few steps. Some passages are very low and you have to pass them ducked. Tha cave itself is washed out by water and thus quite interesting. It’s only a short stop near the road for about an hour or so. I guess, you need more time for all the gift shops at the exit after leaving the boat, then for visiting the cave itself. Btw. you can even only visit the gift shops without visiting the cave. But, in that case, you have to find the exit on you own. Hint: look for the parking ground (located left to the entrance) and you will see a bunch of small log cabins at the caves exit. You can also find a bar for getting a refreshment right next to the cave’s exit. 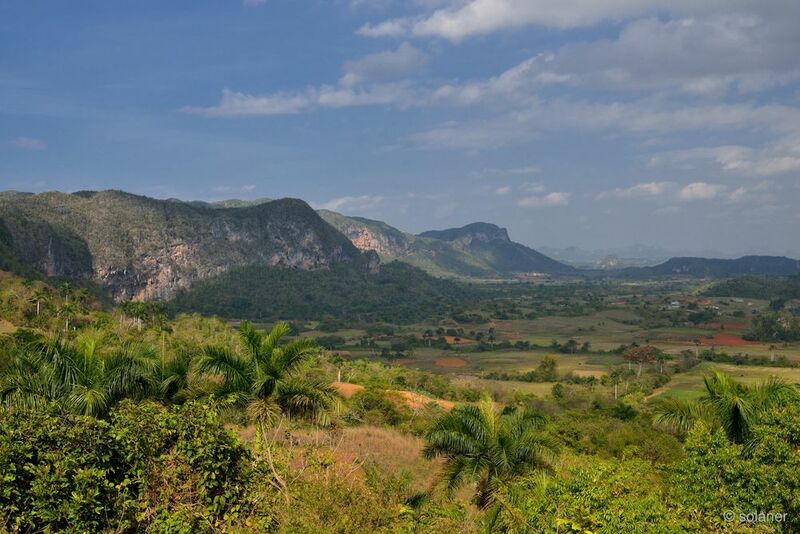 Los Acuáticos de Viñales is a tiny village at the side of one of the hills above the Valley of Viñales. The path to that village looks more like a dry riverbed than a path. It’s narrow, steep and stony. You really need solid shoes for that trip. And you need a local guid to find you way. Neither street signs nor direction signs will help you find this village. 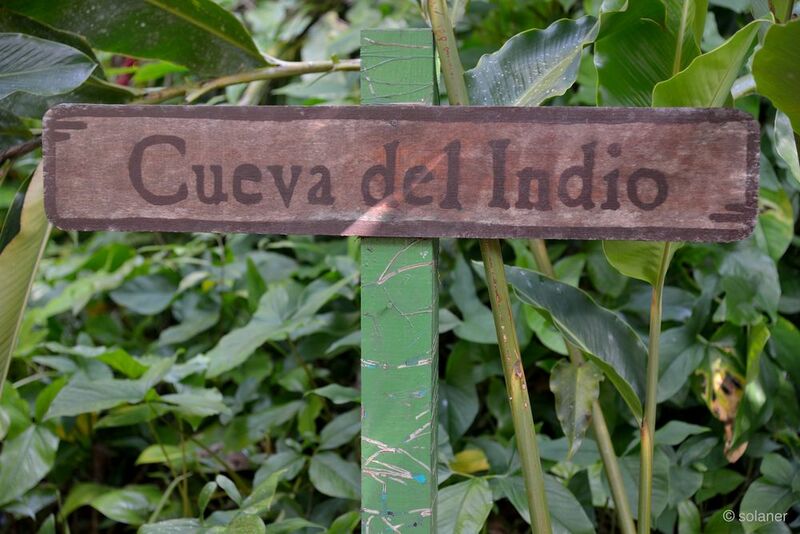 According to our guide, there are only about 12 people are still living in Los Acuáticos.